A guide on handling liquidation/advanves in Xero, and how will it appear in JuanTax. Some companies would often provide cash advances to their employees whenever they need to do some activities (travel, meetings, etc.). Most of the time, these so called "cash advances" are liquidated and are included within the company's list of spendings report. In order for these information to appear in your JuanTax account, you first need to set this up in Xero. 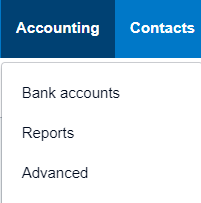 Start creating an account in Xero by going through the Chart of Accounts section. Go to Accounting > Chart of Accounts. 1. Click Add Account button. 2. For the Account Details, select your account type and enter a unique account code. Next up, you need to enter an account name and description (in this one I used Employee Cash Advance), and then select the appropriate tax settings before hitting Save. Once created, you can now proceed on creating bills with Xero. For this process we will create 2 bills: (1) Cash Advance and (2) Purchase of Employee. 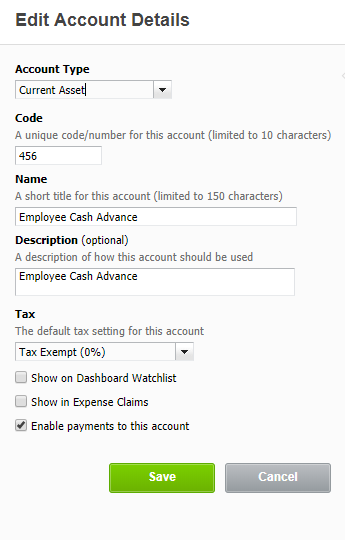 In our first bill, aside from using the term "Cash Advance" in fields such as From and Description, you also need to use the account that you created earlier (Employee Cash Advance in the example) and set the tax rate to Tax Exempt (0%). Click the Approve button to proceed with payment. After approving the bill, you need to pay it by clicking the Add Payment button. But before that, you have to enter the amount paid, date as well as the bank where you would pay the employee. For your next bill, you need to enter the actual purchase made by the employee after being provided with the cash advance. In this one I used a purchase receipt at Starbucks as example, and coded it as VAT on Purchases (Goods)(12%). After approving the bill, you need to proceed with the payment where you also need to include the amount as well as date paid (For the paid from section, I used the account that I made earlier (Employee Cash Advance) and used Cash Advance - 1 as my Reference). Click the Add Payment button to continue. 1. Go to Accounting > Reports. 2. Choose the Accounting Transactions report under the Accounting category. 3. Set the parameters of the report such as Accounts and Date Range (I used the Emplolyee Cash Advance account in this example). Click the Update button after setting it all up. Once the report has been generated, you will see all the information from the bills that you created in Xero under the Employee Cash Advance account. In this report below, it indicates the actual amount that was given to the employee, the purchase made by the employee and the remaining amount from that cash advance. Once you generate a report in JuanTax, you will see the actual purchase made by the employee, and the term cash advance would show up in the reference section of the report.